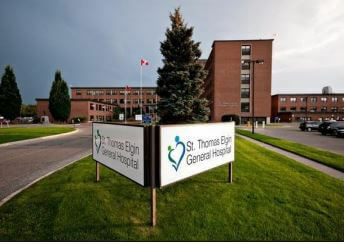 St. Thomas Elgin General Hospital (STEGH) provides care to St. Thomas and eight surrounding municipalities in Elgin County. The 166-bed facility has been providing care to Elgin County residents since 1954. The Health Information professionals of STEGH were spending a considerable amount of time searching for and retrieving patient medical files. Their time consuming, paper-based processes took away from performing value-added activities and providing the best quality patient care possible. STEGH also needed a solution for scanning existing patient files into an electronic system without taking staff away from performing critical, daily tasks. 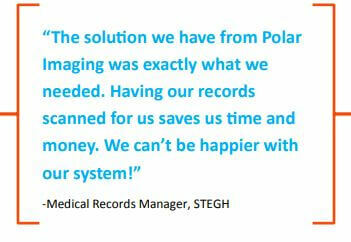 Polar Imaging implemented PaperVision Enterprise, an on-premise document management solution, for STEGH’s medical records department. The new Electronic Patient Record System integrates patient healthcare data and images of paper-based documents into a consolidated electronic patient record. It provides the functional tools for managing the patient’s medical record in a paperless environment. Polar Imaging provided STEGH with access to complete patient information in an electronic, secured and controlled environment. In order to get STEGH’s existing patient information into their new electronic record system (a daunting task for back-file conversions of such large amounts of records), Polar Imaging does the scanning, indexing and importing of files for them. By installing a document management solution, PaperVision® Enterprise, STEGH was able to cut down the retrieval time from hours to mere seconds. The document management solution has allowed clinical, administrative and health records staff the ability to access patient information quickly and securely. Patient records can simultaneously be accessible securely by any computer within the hospital’s network. Costly storage procedures have been eliminated and records are now secured against loss and destruction. The solution has also given STEGH better backup and disaster protection, and increased patient privacy through controlled access to patient files. Internal activity audits allow administrators to track computer inquires for patient information. By outsourcing their back-file scanning to Polar Imaging, they have been able to get their patient records into their new document management system faster, without having to hire new staff to make the conversion. They saved on time and costs, and can rest easy knowing the images are of the best quality possible. 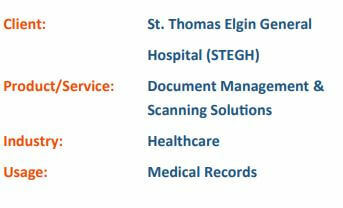 ST. Thomas Elgin General Hospital has been able to increase productivity and efficiency, as well as lower operational costs in its Medical Records department through the implementation of a document management and scanning solution. Find out how this could work for you! Every organization is unique it’s in own way and therefore therefore we custom tailor solutions for everyone! If you’re interested in learning how a solution such as this one could be implemented into your organization, contact us for a free no-obligation consultation! We’d love to chat with you and find out about your needs.